If you’re struggling to eat pizza on a lower calorie diet, you’re going to love this recipe roundup. 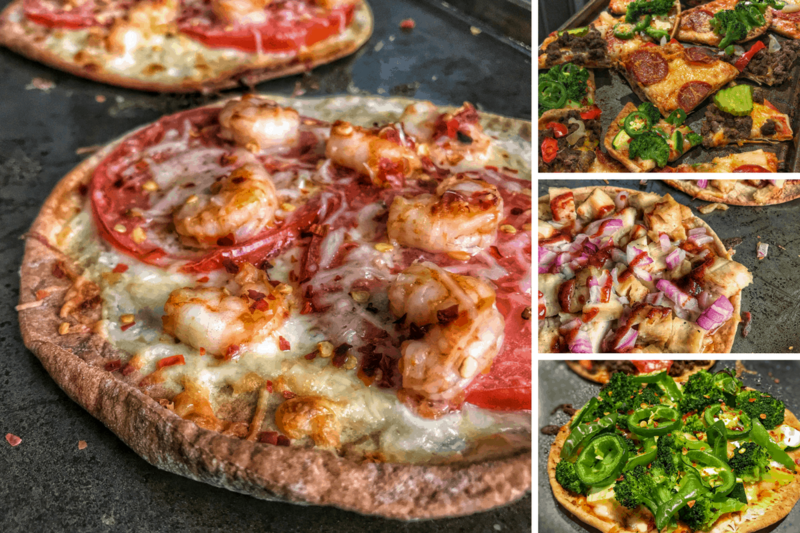 I have six low calorie pizza recipes ranging from spicy shrimp to a meatless green veggie flavor bomb. On the calorie spectrum, the pizzas on this list go from 150 calories to 370 calories. 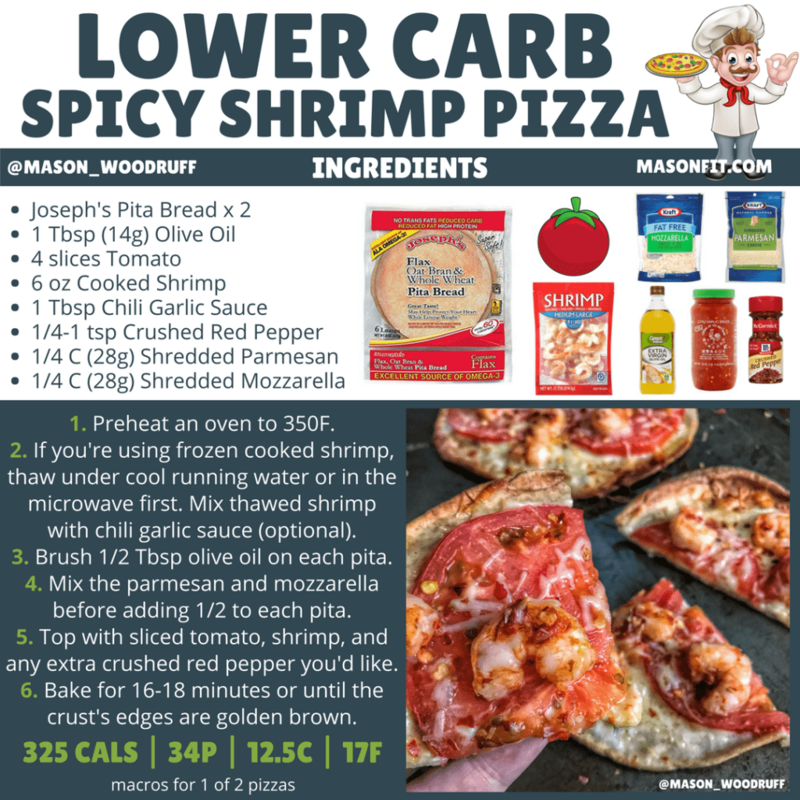 I’ll be sure to walk you through potential ingredient swaps and recipe modifications to make certain pizzas more macro friendly or lower calorie if needed. Before we get to the recipes, I’d like to point out that all the recipes are in infographic form. 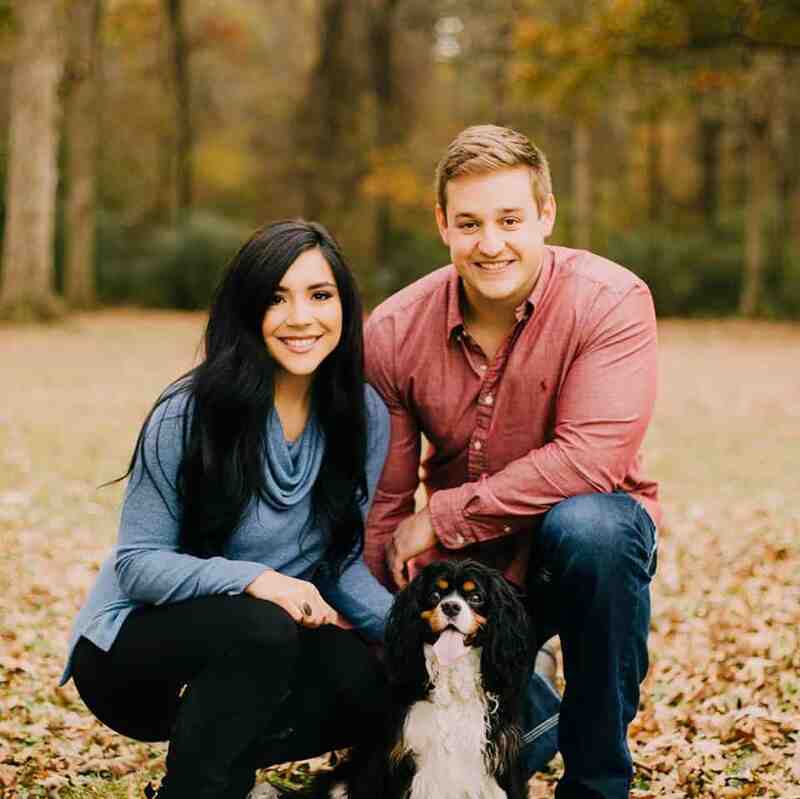 Two of the six recipes were originally posted on my Instagram, and the other four were posted in the Stronger U members group and on their Instagram account. Stronger U is a leader in nutrition coaching, and I’m proud to serve as their self-appointed Chief Deliciousness Officer. 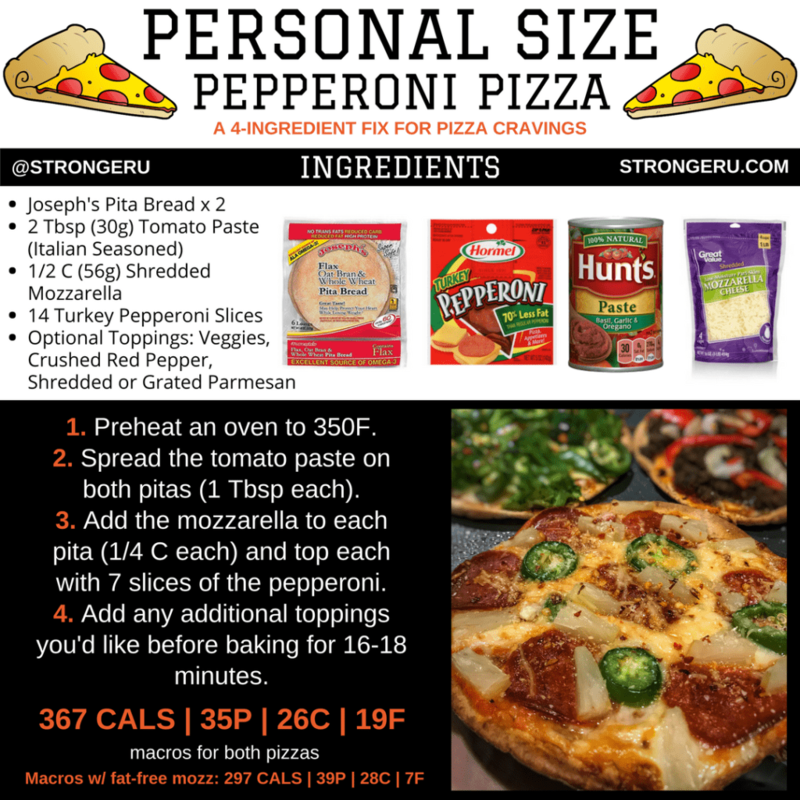 Be sure to follow Stronger U’s Instagram for daily recipe graphics like these low calorie pizza recipes. Okie Doke, the first thing I’ll say is that you can use any pita bread, flatbread, or pizza crust you’d like. All six of the recipes below call for Joseph’s Pita Bread, which has 60 calories per pita. I buy mine at Walmart in the bakery section, but you can buy directly from their site for a great price if you’d like. Once you have your crust situation handled, your next beef will be with protein sources. In the graphics, I tend to choose the easiest form possible, because simplicity is important around these parts. Just know that if a recipe calls for pre-cooked shrimp or chicken, you can replace that with fresh or any variation you’d like. Don’t think these recipes are the end all be all of low calorie pizza recipes. Why not start things off with the least pizza-ey pizza on the list? I say that only because this spicy shrimp pizza is sauceless but don’t worry, it’s plenty delicious. This particular pizza can be quite spicy as is. If you’re sensitive to spice, maybe scale back on the crushed red pepper and even the chili garlic sauce. All right, the next recipe tweak I’d like to cover is cheese. You’ll notice that some of the recipes use full-fat shredded cheese and others use fat-free or reduced-fat cheese. 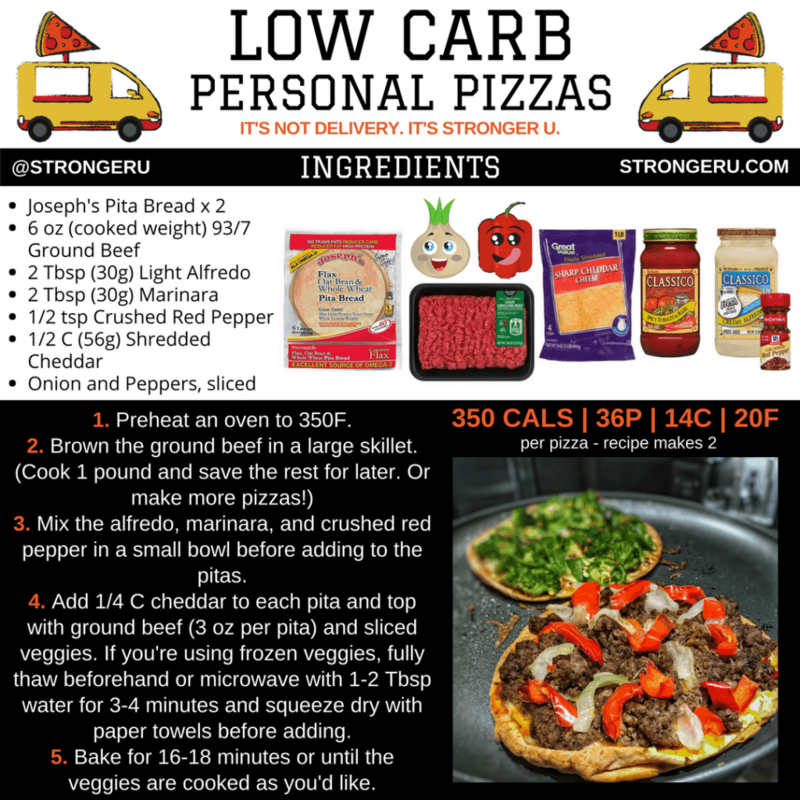 This is one of the simplest ways to reduce calories and fat in your low calorie pizza recipes. I’ll add that parmesan is best left alone, mozzarella is relatively low calorie anyway but can be reduced without losing much, and cheddar has the most wiggle room between reduced-fat variations. 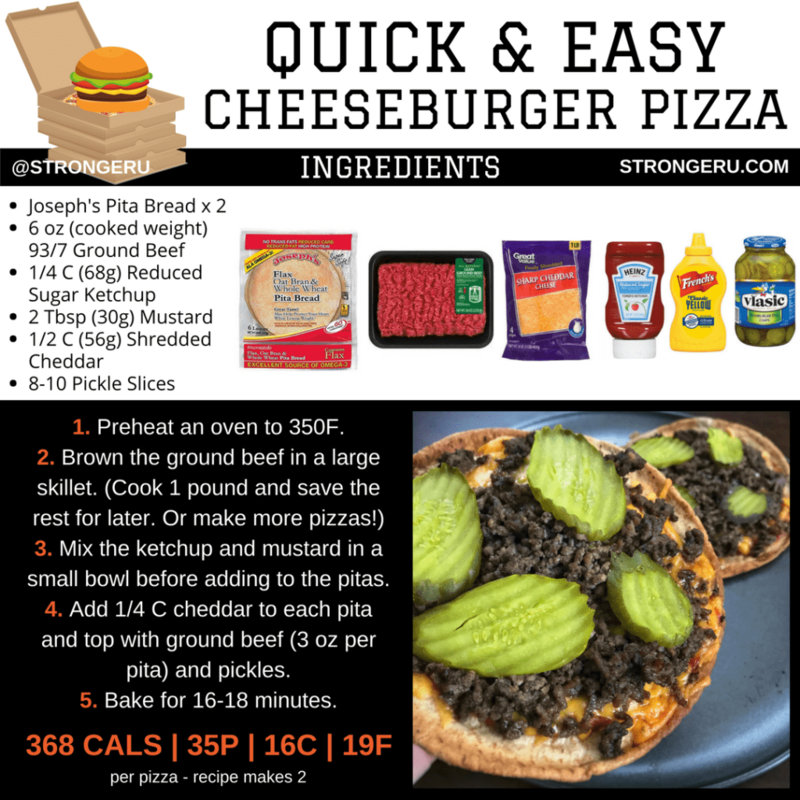 Going from full-fat to fat-free in this cheeseburger pizza, for instance, would save you over 60 calories (primarily from fat) per pizza. If you like this pizza, it’s also easy to stuff the same ingredients into a cheeseburger quesadilla. 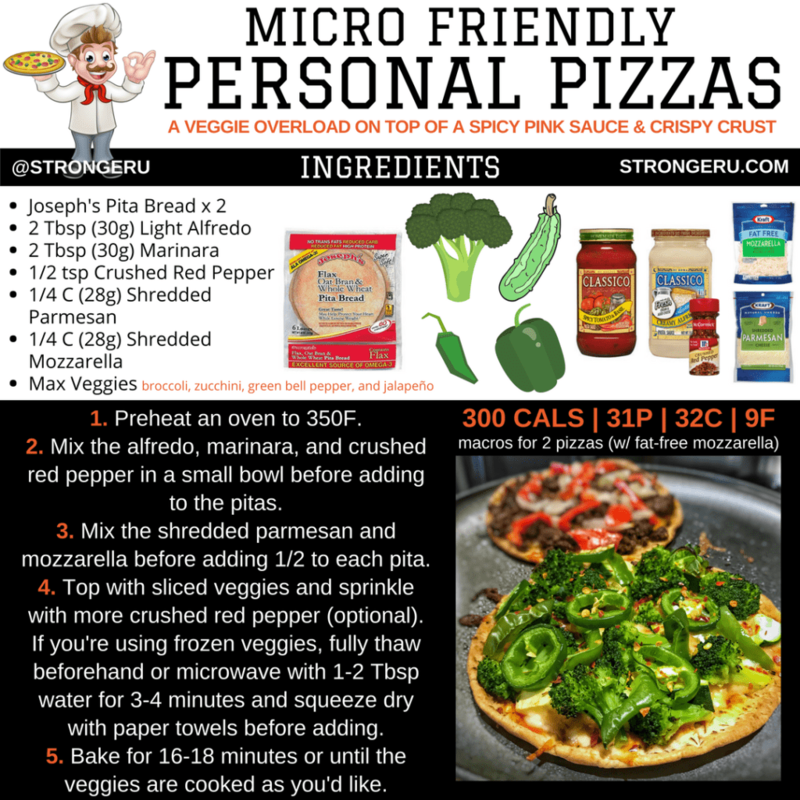 I mentioned the 150-calorie pizza in the introduction and here you have it—the not so borophyl personal pizza. You’ll never believe how tasty an all vegetable pizza can be. This might be the easiest to prepare pizza on the list. If you buy the pre-cooked chicken, you’ll be prepped and ready before the oven is even preheated. It’s a close race between this pizza and the spicy shrimp pizza for my top prize. There’s something about onions and peppers on top of a cheesy beef pizza. Yum. Okay, I lied. The best pizza of all time is clearly pepperoni, jalapeño, and pineapple. Sorry, it’s not up for debate. You may have noticed I switched from the basic marinara to tomato paste. The move was primarily to show that you have other options for pizza sauce. Get creative and have fun with your sauce. It can drastically change the flavor of your pizza. Okay, that’s all folks. I’m certain these low calorie pizza recipes will have you set for quite some time. But while you’re here, I’ll point you towards my free cookbook for pizza lovers. 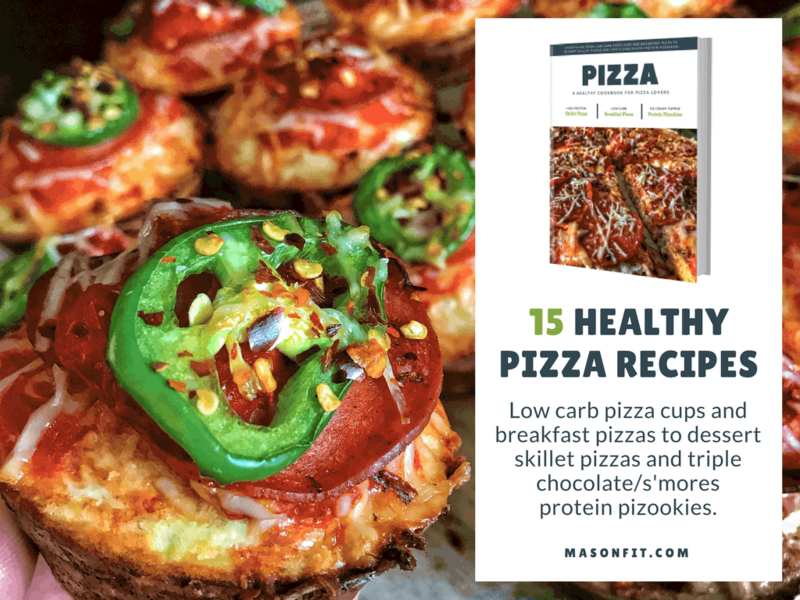 Inside the cookbook, you’ll find 15 of my most popular high protein pizza recipes. You can check it out here or simply enter your email in the form below to have a copy sent straight to your inbox. I have to buy josephs pita break WEEKLY. Between the hamburger quesdillas and pizzas. I have made so many variations of pizzas using this and I love it. It’s the perfect amount and so easy to fit into my macros. HIGHLY recommend any of these ! 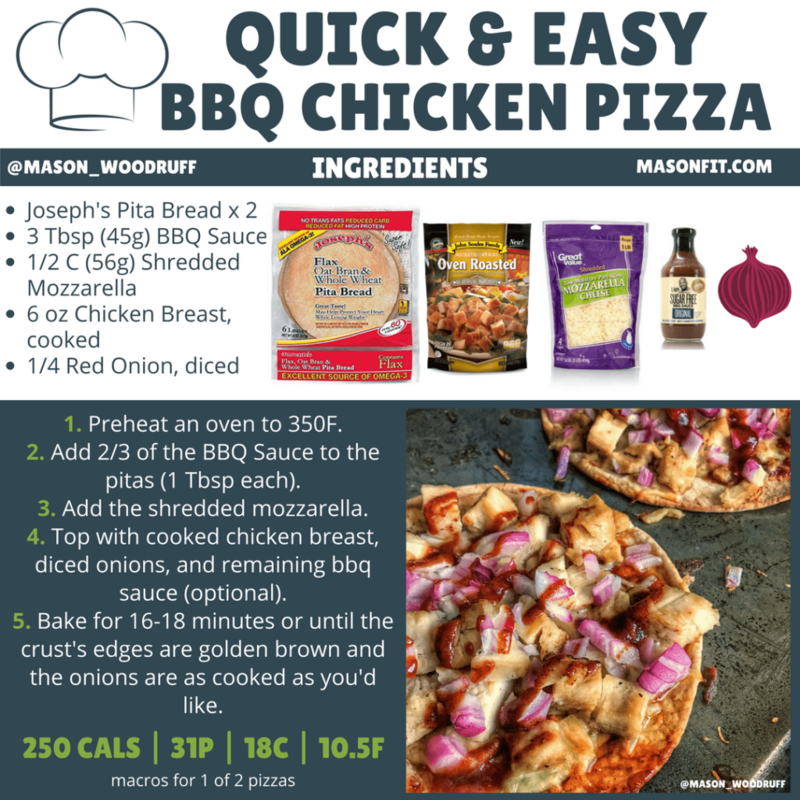 For anyone with strict calories, or on a competition prep – this is going to scratch your pizza itch (and my pizza itch is almost daily). If you’re really watching your carbs, I suggest the carb balance pita’s by Mission – they’re a lifesaver.